It looks really massive! 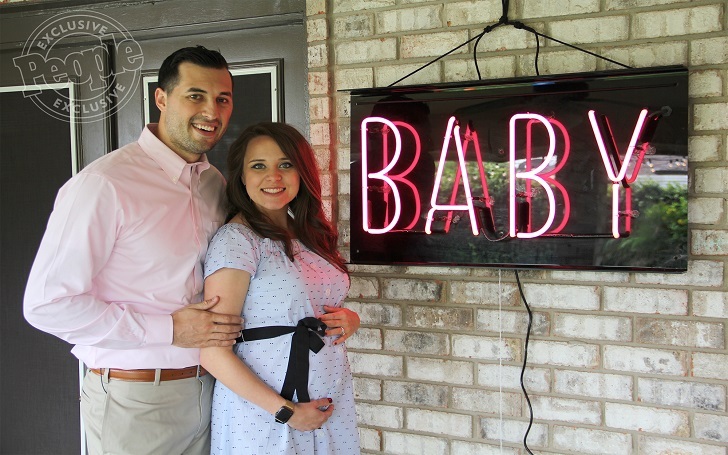 It's been more than six months that Jinger Duggar announced her pregnancy with husband Jeremy Vuolo and the 19 Kids and Counting star celebrated her 38th week of pregnancy, sharing a photo of herself showing off her massive bump. Almost there! ???? Vuolo #38weeks4days @jeremy_vuolo and I can’t wait to meet our baby girl! ?? As previously reported, on January 4, the 24-year-old Counting On star announced that she and her husband are expecting their first child. Later in April, the couple revealed on the Duggar family’s website that they will be welcoming an adorable daughter. Congratulations Jinger and Jeremy on expecting your first child! We are so excited for y’all and know you’ll make excellent parents! Israel and Sam are getting at least 43% more cousins in 2018 and they be excited like WOOO!!! ?????????? Jinger first met Jeremy, who is a former professional athlete, while on a mission trip to Central America in 2015 and eventually in June 2016, they announced that they were dating. One month later, the became engaged before getting married on 5 November 2016. The happily married couple currently resides in Laredo, Texas, where Jeremy works as the pastor of a local church.